If a blog has a birthday and its frazzled overwhelmed writer misses it, does she get kicked out of the blogging club? I need reminders like that or I miss things. Or maybe I just need a personal assistant. Anyway, on the occasion of this blog’s 55th week in existence, I thought I’d take a little look back. I had written a few things before starting this blog last year, including a piece for The Boston Globe Magazine and one for Autism Speaks, which is now included in their 100 day Kit. There was something cathartic about sharing our story for the first time. I was finding that I needed a space to write more, just to get the words out of my head. At this point, we were only three months into my son’s autism diagnosis. Through my extensive research on autism (thank you Google), I came across so many stories that felt like my own. People sharing bits and pieces of their daily lives. And with each one I read, I cried more. 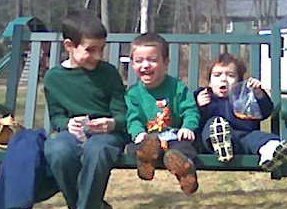 One day I was reading a story about sensory processing disorder, and there was a link to Hartley’s Life With 3 Boys. As I clicked around her site, I felt right at home. Her life with her three boys was very similar to mine. And she was looking for people to join her SPD Blogger Network. So I did. And this blog was born. In these 55 weeks, so much has happened. The SPD Blogger Network has now blossomed into its own site, and I’m proud to be a writer there and its newsletter editor. I’m also lucky enough to be a contributing writer to Hopeful Parents and on Hartley’s site itself, and on our local autism resource center’s blog. I helped a friend launch her Special Needs Sibling Saturday. I joined with friends to strongly (*ahem*) encourage Parents Magazine to include real life family stories for Autism Awareness month. But the best part about this year has been meeting all the incredible members of this community. When I started writing, I felt so alone. Now I’m part of a family. I can get up in the morning and know that at least 20 – 30 people have my back. I have people I can turn to when things are tough, and friends who understand the importance of the small things. The writers that I have met along the way aren’t just faceless people who post comments – they are my lifeline. There are my Facebook friends now. My Twitter buddies (no, I still can’t say “tweeps”). Many of them I have now met in real life and many more I hope to meet very soon. Because of them, I can breathe again. I can get out of bed. I can laugh and cry and not feel like I’m the only one. Because of them, this blog has changed my life. I would be lost without these incredible people. Many of them are listed on the sidebar of my home page under “You’re the Inspiration”. It may be a cheesy Chicago song, but it’s completely true. I could use this space to list off my favorite posts, but every post is special to me in its own way. So I’m taking a page here from my friend Spectrummy Mummy. In the interest of awareness and paying it forward, choose a blog from my list. I have learned so much from the people behind those titles. Instead of leaving a comment here, click on any one of them and meet someone new. Then share it with a friend. I’ll end with this. The one thing that has not changed over this past year has been the reason why I write. I write for these incredible boys. They are my world. They are the ones that have taken me on this incredible journey. We defy gravity together. Here’s to the next 55 weeks together. CONGRATS! I, for one, am really glad I discovered you. Your writing is so deep, heartfelt, and meaningful. Your an inspiration to ME. Thank you. Happy belated birthday..and here’s hoping there are many, many more. Happy Blog-versary!! That’s exciting! I will echo the above comment and say that I, too, think your writing is amazing. Thank you for sharing your stories! Thank you Jaimee! You were one of the first blogs I found thru Hartley and I am so glad to know you now. Thank you! I’m going to have to hire one someday just so I can have time to read all the great blogs out there like yours! Happy Blog Day! There should be a card for that. No….there should be cake! You deserve cake. And comments. Many comments thanking you for putting yourself out there and into our lives. We are all richer for it. Rich like chocolate cake. There’ll be cake, right, when we meet? Happy Blog-day!! 🙂 I am glad I found your Blog! The “Your the Inspiration” reference is SO not cheesy! It’s TRUE! It is because of your blog, and many of the others you listed, I have started posting more on mine…reaching out, and SO glad I am not alone on this Journey! Thank you! Oh thank you! Everyone who takes the time to sit and write their story so others can learn from them inspires me. Glad you’ll be writing more! Congrats on a year! I love your blog and am so glad we found each other. It’s all about support in this crazy life. My blog buddies mean the world to me. Thank you! So glad we’ve met this way too!! Happy blog-a-versary and congratulations on an amazing year. I look forward to reading your posts (even if I do not always have time to comment) and love your beautiful, fluid style of writing. Here’s to another year of blog-buddy-dom and friendship! Thank you! So glad to have met you too! I been reading since the very first one. I know how writing this blog and helping others is something very important to you. But know that you give even more back to all of us. Here is an “imaginary hug” for you. and air smootches xoxoxo. Your writing inspires me! I’m so happy to have found your blog and you! Congratulations on a year of blogging! Your writing is beautiful and your sharing your journey is such a gift!!! Here is to another year!! Happy Blog Birthday to You!!! !